Back with a mix of new songs as well as favourites like Oceans and What a Beautiful Name, Hillsong Kids' new DVD is fizzing with energy and life. Alive with truth, and alive with hope. 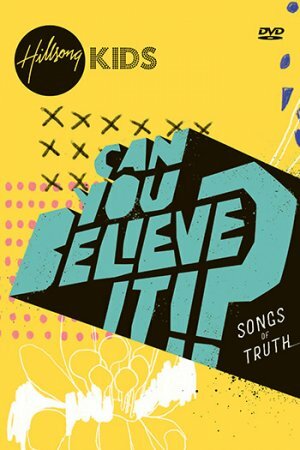 ‘Can You Believe It?’ is the long-awaited new album from Hillsong Kids. Made to speak to the coming generation of God’s goodness, this new release features iconic Hillsong songs like Oceans and What A Beautiful Name, as well as all-new tracks like Heaven Is Our Home and the super funky We Came To Meet With You. It’s been six years since the last Hillsong Kids release, but that energy and excitement is still bursting from every glittering song. Based on Psalm 78:4 - "...tell to the coming generation the glorious deeds of the Lord, and His might & the wonders He has done." - ‘Can You Believe It?’ is on a mission to invite children into God’s presence. To experience God’s joy for themselves. Part challenge and part, well, party, this new album shows how fun and engaging kids worship is. Can You Believe It!? by Hillsong Kids was published by Hillsong in September 2018 and is our 972nd best seller. The ISBN for Can You Believe It!? is 9320428332660. Buy Together Offer for Can You Believe It!? Reviews of Can You Believe It!? Be the first to review Can You Believe It!?! Got a question? No problem! Just click here to ask us about Can You Believe It!?. Classic songs like "My Best Friend", "Oceans (Where Feet May Fail)" and "What A Beautiful Name" join brand new declarations of faith such as "As The World Shakes" & "Heaven Is Our Home". We pray that this collection of fun and vibrant songs, help children around the world to declare biblical truths about God's love and grace for them. Details for Can You Believe It! ?